It was so nice to do a bit of cross stitch again lately! I finished up these two small projects on my vacation and there is something so good about a nice bit of linen in hand and some lovely hand dyed threads. Both of these are designed by Su Mwamba of Tanglecrafts (http://tanglecrafts.wordpress.com/). The top one is entitled "Kaleidoscope Thistle" and the bottom one is "Kaleidoscope Forest". Su designs the most gorgeous stitchery - check out her blog and you will see lovely freeform bargello and other treats. These two are small projects that give lovely results without a lot of investment of stitching time - I am really pleased with the way they turned out. Now I just need to decide how to finish them... paperweights? scissorfobs? pincushions? Not sure yet! Briefly, here is an explanation of Build a Seam. Every Sunday I'm going to post a picture of the basic bare bones of a seam treatment, and we have a week to decide on and complete whatever other stitches and embellishments are needed to make it a complete - and gorgeous! - seam treatment. I am looking forward to training myself to see beyond the basic herringbone or cretan stitch I like to fall back on, and to learn to make more passes across the seam adding more stitches, beads. SRE, etc. This is all happening on the Crazy Quilting International Novice site and I am going to post it here as well in case anyone else would like to play along. If you would like to share please post a comment with a link to your blog or wherever we can find the picture. I would love to post some pictures of finished seams here. Thanks! This is the framework for week one - an intertwining row of scallops or half circles done in chain stitch. I think there is some room here to work! I hope someone else will play along! Just a note to say I will be away on vacation for a week. Hopefully I will have lots of stitching to show for these days away, new stash and photos. I'll be back next weekend. In the meantime, I have about two hours to frantically get together threads, etc to take with me! Gotta run! So, here is the baggie Cathy won - hope you enjoy it Cathy! 10. - "Home Sweet Home" book subtitled "25 Beautiful Cross-Stitch Designs for Every Room in the House" , a Vanessa-Ann Collection along with some waste canvas. There is a method to my madness here! I love using waste canvas to stitch cross stitch motifs onto cq blocks so I figure this is another chance to convert someone! The book has large pictures and samplers in it but there are small designs that can be lifted out of them - some nice trees, autumn leaves, etc. This is how I usually find my motifs to cross stitch since a lot of the smaller designs that are meant to be stitched by themselves can tend to be too cartoonish for cq. 13. - a piece of silk that is either plum or brown, can't decide. All these are lightweight silks I found in a "cloth shop" in the city. Have you checked out the sari shops yet for inexpensive lightweight silk in a rainbow of colours? You should! It isn't dupioni, of course, but it is silk and the colours are fun! 16. & 17. - two pieces of silk both of which change colour depending on how the light is hitting it. One seems to go from purple to blue and the other is a mauve/rose colour with blue undertones. More finds from the sari shop! 24. - a few funky old plastic buttons. Don't usually like plastic but if it old enough I do! 38. - two little ladybug beads. Whew! I was getting out of breath there! I hope you have as much fun with these little treasures, Cathy, as I have had putting the goody bag together! I have discovered it is even more fun holding a giveaway draw than it is entering them so I'll be having more. I'll think of a different twist next time! Good morning! Well, I came home from the lake yesterday afternoon and the first thing I did this morning was to fill up my trusty ice cream tub with the 38 names of people who commented on the Giveaway Post. DD did the honours of pulling the name and the winner is..... (drum roll please)....... Cathy K! So, I started with the basic squishie containing a couple of oyas, two specialty threads, a few lengths of fancy yarns (they make such great seaweed couched down with feather stitch! ), a silkie Jill made of a little victorian girl with a snowshovel, a couple pieces of gold embroidered taffeta and some organza ribbon for SRE like I used on the pink roses on Candy's block. I pulled the name on time but have been busy coming up with 38 other things (one for each person who commented) to put in the baggie! lol Cathy - if you can email me your address I'll send it out this week. I'll post a picture of all the goodies too so you can get a preview! I had a delightful piece of mail yesterday - my scissor fob from Laurie arrived! Here it is - the picture is a bit dark - these are beautiful purple beads separated by pearls and the nicest flat pink bead and then a little tassel made of crystals. As you can see, it is already in its new home on my little stork scissors. Thank you, Laurie! I love it! I posted a picture a few days ago of Candi's block I received to work on in the CQI "On the Seamy Side"Sampler Round Robin. I have now finished my work on it. This go round the stitches to be used were fly stitch and spider web roses. In the picture above is the first motif I did on Candi's block. I made three spider web roses with a shimmery organza ribbon. I placed them on a bed of fly stitch leaves done in a variegated thread. I added rose buds and a sprinkling of clear beads. This was the second seam and it is just a very simple fly stitch topped with little pearls. Very simple. If you look below the seam though you will see where I may have lost my mind. I kept looking at the silkie on this block, especially her gorgeous hat with the ostrich feather flumes. I kept thinking .... EMU FEATHERS!! So, I went ahead and added some. I sure hope Candi likes them cause they are there to stay! Of course, they can always be trimmed and shaped into a more pleasing shape when Candi gets the block back. This last picture is the whole block after both Clairee and I have stitched on it. It will be heading off in the mail to its next stop tomorrow morning. My work on this block gave me a couple real challenges. 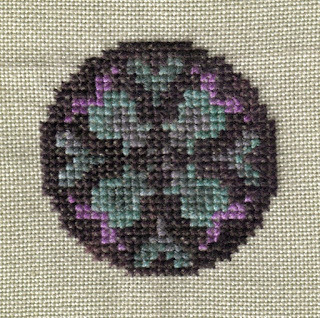 These two stitches (fly stitch and spider web roses) aren`t high on my list of stitches I use often. When I first did the motif with the pale pink roses I had scattered silk ribbon french knots around it in two or three colours. My initial instinct was to scatter pearls but I had already used them on the fly stitch seam so I thought that might have been too many pearls. But those french knots bothered me because they seemed too busy. Took them out - even though I virtually never `reverse stitch` - and then of course you can`t take out silk ribbon work without leaving a mess. 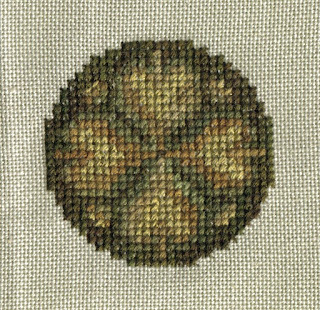 So where each french knot had been there is now a clear bead and I am happier with the end result. Following my trusty A - Z of Ribbon Embroidery book I marked circles for the spider web roses. I thought I would use that water soluble pen. Seemed to work fine. Afterwards I used a q-tip and water to moisten the marks and set it aside. When I went back I looked at the back first and that gorgeous variegated pink thread had run! I was almost afraid to turn the block over but luckily nothing ran on the front! Whew - got off lucky that time! The last challenge the block gave me I didn`t rise to meet. I have looked at what I have done and I am vaguely unhappy with it and I think I have boiled the problem down to one of scale. What I did - and cannot now undo - is to make things that are too large for the block. I should have gone with more delicate looking stitching. But, unfortunately, I can`t fix that now (Sorry Candi!) . Hopefully someone further down the round robin circuit will find a way to balance out the block better than I have done. Just wanted to share an idea that has been perculating from the CQI Novice Group. We have decided it would be fun to have something called "Build a Seam" starting the first week in October. I am going to blog this as it goes along so we can play here as well as in the group. Each Sunday I'll post the "bare bones" of a seam treatment and throughout the week we'll take that and add to it to see what each of us comes up with as an end result. For instance, the first week could be a scalloped line of chain stitch. Now, what would you add to it to make a complete seam treatment? Straight stitches and beads? Spider web roses? The idea behind this is to learn to build on a seam with different stitches to come up with interesting treatments. I think it will be interesting too to see the differences between what each person does with it! So... don't touch that dial! Stay tuned! By the way, thank you to everyone who has left comments on my Giveaway post. The baggie is getting plumper with each comment! I have entered each name in the draw and there is still time to leave a comment on that post to get in on the draw. No pictures in the last two posts - how boring! My excuse is that in eight sleeps I will be at home again after another summer camping at the lake. So, I am in the throes of packing and getting ready. Where did all these books come from? I didn't bring this many with me!! lol I'm running home with loads of boxes because I am deathly afraid that if we tried to pull the trailer with all these books and my stitching stash it would fall apart at the seams! I have even managed to accumulate an old hutch I want to refinish! Keep your fingers crossed for me - maybe tomorrow it will rain all day so I can stitch! I am feeling like celebrating for various reasons! Firstly, this is my 100th post on my blog and that seems worthy of a little celebration. Secondly, I can now count the days on this year's camping season on my fingers! It has been a busy summer out here at the campground and I am anticipating getting home for a rest - I am so looking forward to hot showers, a real bed, good lighting and my comfy stitching chair! So, I have decided to celebrate with a giveaway! I think these are great fun and have put my name down for several and even won once so it feels like time to be on the hosting end for a change. 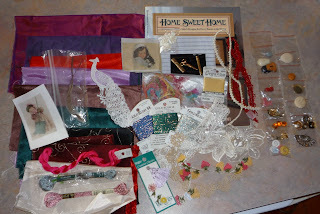 I have decided to give away a squishie of items for stitching, embellishing and inspiration. I can't show you a picture right now because of the twist I have come up with! I'll start out with a squishie containing some fun items like an oya or two, specialty threads and fancy yarns, a silkie and a couple other things. For every person who puts their name in the draw by leaving a comment on this post I will add something else to the squishie! So hopefully lots of people will enter the draw and then it will be a huge old bundle of goodies some one will win! Thanks for helping me celebrate! I will draw names on my first day home - September 15th.